Wedding ceremony sites are abundant in Orange County, California. These romantic and unique wedding ceremony and reception locations can accommodate whatever type of wedding you envision. The beautiful beaches of Laguna, Newport and Dana Point provide the scenic settings for many Southern California nuptials. While some people planning small or casual weddings opt to marry on the public beaches of the OC, more choose stunning oceanfront properties for their vows. This south county hotel sits high on a hill overlooking Dana Point harbor. The Laguna Cliffs resort's lawns offer stunning view locales for ceremonies and receptions, and the hotel also offers ballrooms and restaurants to accommodate gatherings of nearly any size. This classic Orange County beach hotel is a lovely venue and hosts many weddings each year. The Laguna Cliffs Marriott hotel is located at 25135 Park Lantern, Dana Point, CA 92629. Looking for a casual restaurant location for your wedding? Definitely check out Las Brisas restaurant seated above main beach in Laguna. The seafood-oriented Mexican menu is sure to delight even discerning diners and the view cannot be beat. Consider reserving the public gazebo behind the restaurant for your ceremony and holding your reception in the restaurant. Las Brisas is at 361 Cliff Drive, Laguna Beach, CA 92651. Looking for a top tier wedding location? 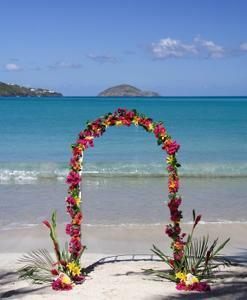 Always dreamed of an elegant beach wedding? The wedding planners at the coastal Montage property in Laguna Beach can handle a large five-star event or create an intimate beachfront romantic wedding for you. The award winning restaurants at the Montage property will give your guests a meal to remember. 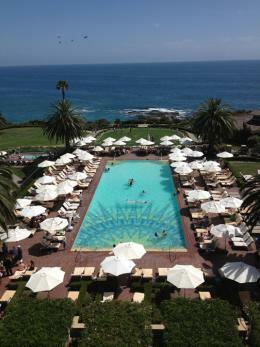 Montage Resort is located at 30801 South Coast Highway, Laguna Beach, CA 92651. The St. Regis in the Monarch Beach area of Dana Point, California is known for exquisite service and amazing luxury. Approximately half a mile from the beach, the five-diamond St. Regis offers an elegant spa, superior golf and world-class dining options. The property offers multiple locations for indoor and outdoor weddings of various sizes. If you are yearning for the perfect fairytale wedding, you have to consider the place that really knows how to treat you like a princess. Disneyland offers a wide array of wedding locations and packages, from venues in their several hotels, restaurants, and within the Disneyland park itself. While Disney will create an event for nearly any budget and fantasy, note that you cannot have outside food or beverages brought in to a Disneyland event. To plan your Anaheim Disneyland wedding event, contact the Disney event services office at (714) 956-6527. Situated in the Cleveland National Forest, Rancho Las Lomas is a stunning backdrop for weddings and other special events. East of Lake Forest and Foothill Ranch in Silverado, the Rancho has an outdoor theater perfect for ceremonies and both indoor and outdoor reception venues on the property. Rancho Las Lomas is also home to a full zoological garden and has been frequently used as a film location. Contact the facility at 19191 Lawrence Canyon, Silverado, California, 92676. This historic restaurant is adjacent to the Mission at San Juan Capistrano. Renowned for the swallows that return annually, this quaint town is a cornerstone of California history. El Adobe's Palenque room is an atrium-style venue and can be used for ceremonies or receptions. The facility at 31891 Camino Capistrano San Juan Capistrano, CA, can handle weddings of up to 400 guests. While the Sherman Library is in the beach town of Corona del Mar, this wedding venue offers garden views. Up to 250 guests can enjoy the courtyards, fountains and patios of this glorious showpiece nestled on the Southern Orange County coastline at 2647 East Coast Highway Corona Del Mar, CA. Less than traditional but no less than spectacular is the Marconi Automotive museum; this unique Orange County site is a remarkable ceremony and reception option. Say your vows in front of up to 300 of your closest friends while surrounded by exotic cars at 1302 Industrial Drive in Tustin, CA. Choose to hold your wedding in the museum or on the elegant veranda. The Muckenthaler mansion on a 9-acre estate can be used for indoor and outdoor weddings and events. Styled in Italian Renaissance, this unique facility can hold up to 500 guests indoors (although they have areas suitable for gatherings as small as 20, too) and can accommodate more outdoors. You must use the exclusive caterer for the Muckenthaler Cultural Center if you choose to have your event at this facility located at 1201 W. Malvern Avenue in Fullerton. Planning a large wedding? Consider the Bayside Pavilion at Newport Dunes. It can accommodate up to 600 people, all with a view of the bay. The resort is located at 1131 Back Bay Drive in Newport Beach. The stunning Crystal Cathedral church is a momentous venue for a wedding ceremony. One of the most recognizable landmarks of the area, the Crystal Cathedral is situated at 12141 Lewis Street, Garden Grove, CA 92840. The beauty of planning your ceremony and reception in Southern California is that there are so many options. Narrow your choices by figuring out the type of event you want to create, knowing the approximate number of guests you will have in attendance and then visit wedding ceremony sites in Orange County until you find the one that feels just right for you and your betrothed.